Good for the proximity to Fredericksburg, LBJ Ranch, decent BBQ and TX Hill Country wildflowers- but very tight spacing and noisy from the almost constant drone of motorcycles just outside the park. Half the park is a gravel parking lot near the highway. We stayed in the half with decent shade and farthest away from the road noise. Staff was friendly and the park was clean with a tidy grassed dog park. Worth staying if being right in Fredericksburg is your thing, but not if you prefer a more quiet environment and a little space between you and your neighbor. We camped at Oakwood RV Resort in a Motorhome. As many others have reported the sites here are way too close. We opted for a premium site, site "D" and even this site did not adequately fit our 40' motorhome. The depth was ok, but our drivers side slide was completely over the neighbors patio. On the passenger side slide we had to move the motorhome forward (sacrificing parking area) so that we could even open our outside TV compartment. By the time our passenger side slides were out and with our neighbors slide out we could not sit comfortably on the remaining patio. Even getting to the back of the coach was difficult because there was a shrub in the way. Whoever decided to use shrubs in lieu of trees has never really camped in an RV park. And speaking of trees, there were none, there are plenty in what I would assume the older part, but the section we stayed in had very few. At our neighbor's location, the sewer line was coming up in the middle of the slab. Our traveling companions had one of the premium pull through sites and it was way worse than ours. The crew has to spend an inordinate amount of time helping folks park because a few inches to the right or the left makes a huge difference. We will not be staying here again. We camped at Oakwood RV Resort in a Motorhome. We were warmly greeted by the registration staff. We found the campsite to be very tight. If you want some feeling of "your own space" this might not be the place for you. There are some permanent residents there, or so it seemed, and some of their sites and equipment could use some upkeep. The only other comment I would have is that we were at the opposite end of the campsite from the dog walk area, we are not young and have some physical limitations, so even if you clean up after your dog (which everyone should) there is no grass except for the dog walk area. So keep that in mind when you book if this pertains to you. Cable was good, WiFi worked, site was level. We camped at Oakwood RV Resort in a Motorhome. Sites are dirt with small concrete patio area. Way too close to next site. Very difficult to park big rig. Sewer connection directly next to patio of neighbor site. Our neighbor's slideout actually hung over our patio. Neatly trimmed bushes separate sites barely leave enough room for slideouts and make it impossible to get into storage area beneath motorhome. There are some larger sites if you want to pay higher price. Would not stay again. We camped at Oakwood RV Resort in a Motorhome. Lots of trailers have been parked here for a long time. The two rows near the office, used as overnight, or short term spaces, are short pull throughs. If you are towing a trailer of any size, you will have to unhook after getting on your site. All hookups are at the very rear. Sites are gravel, but have concrete patios. Neighbor's slide was overhanging our patio. Wi-fi worked well at our site. Restrooms and showers were spacious and clean. Rate was PA for one night, only. The most positive thing about staying here is the Mexican restaurant across the street. Hilda's is definitely a place not to miss if in the area. 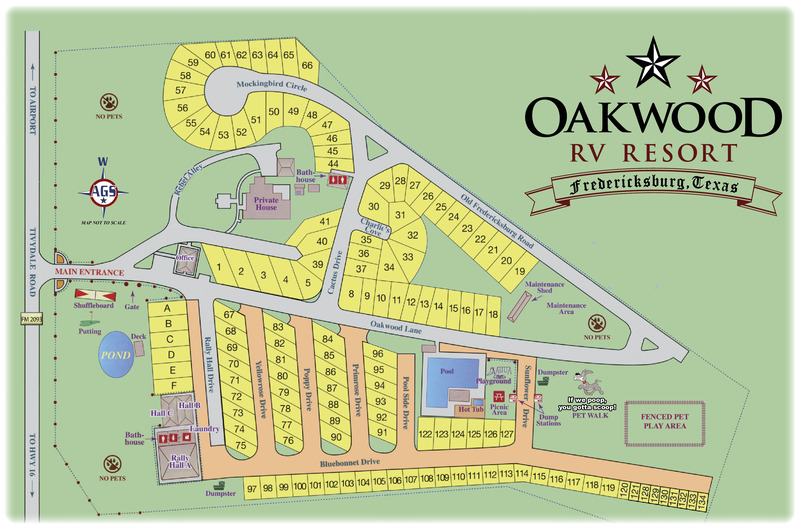 We camped at Oakwood RV Resort in a Travel Trailer. The check in lady was very nice and helpful. However when using the Passport America discount you get the bargain basement spots. No shade, very close and cramped, your slideouts will be over the next camper's concrete slab with the picnic table on it. Sewer hookups are on the same slab as your neighbor's picnic table which is a little odd. Wi-Fi is very good. If this park has restrictions on sites with discount it should have been listed in the directory. Will not stop here again. We camped at Oakwood RV Resort in a Fifth Wheel. We just got home from Oakwood. We had a nice time. The pool needed attention, didn't swim, due to the rain. We stay here when we are in the area. The spaces are tight. The rest rooms were very clean. Front loading washers, have to get use to them (less Water) Park was filling up for the weekend. We stayed Mon-Sat. and enjoyed the town. We use this as a base-camp and go site seeing and shopping. SEE ALL YOU CAN, while there we went to see LBJ Ranch... We totally enjoyed this. You will too. 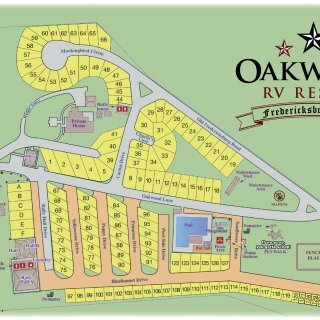 We camped at Oakwood RV Resort in a Travel Trailer. Wasn't my first choice for staying in Fredericksburg. Older park with numerous narrow (read difficult access) pull through sites. If a fellow camper with more experience hadn't been there to help I'm not sure I could have gotten my 31 ft 5th wheel into the site. Between the raised concrete pad and the utility connections I only had about a foot on each side of the trailer after I was parked. This was after asking for a site with "easy" access. OK if other options are full but other campgrounds in the area have easier access. We camped at Oakwood RV Resort in a Fifth Wheel. Sites were very tight. We have a 40 ft MH and with the slides out, we were nearly touching the picnic table in our patio area, as was the fifth wheel next to us touching it with his slide. We will probably not stay here again as we found the management in the office was surly and not very helpful. There are too many other places around where people are glad to see you come in. We camped at Oakwood RV Resort in a Motorhome.